REFLECT: Who has been called to do the work of ministry? RESPOND: List the attitudes of ministry found in this chapter. What a convicting and inspiring portion of Scripture. The attitudes of ministry found in this chapter are numerous! I think most of them boil down to learning to put others before ourselves (ie: humility, gentleness, patience, forgiveness, etc). It is about putting God's interests and agenda first and caring for others so they see the love of Christ through us. Lately I have struggled with being humble and being cheerful in the servant's role. This chapter really helped remind me of role God has placed me in! Growing up I had a great family, but it always seemed to change. New step brothers and sisters that were "thrown" at you. You had to go be nice. So, I really turned to friends. I realized that they freely chose to be there for me. It wasn't because "Moma said". So I tried to be the best friend I could. To be worthy of their friendship. As I think about the Cross and all it means I remember my freinds choice to be there for me. Then i stand amazed that the creator of all freely chose to send his Son to show me one thing, His Grace! Wow! I fall so short living up to that calling. Definitely not worthy. Still he trusts me to be his hands and his feet in this world. He has entrusted himself to us. We are those called to ministry!!! 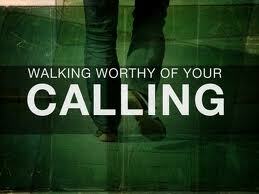 May we choose to share his grace and be worthy of the calling!!! v. 22 "...put off my old self" that's what I need to work on.